FOLLOWING GHOUTA’S LIBERATION, SYRIA WINS BACK ITS SOVEREIGNTY OVER MOST OF ITS TERRITORY – Far from Eastern Ghouta having been a ‘rebel district’ of Damascus, it was for years under the yoke of ‘extremist’ and fascist Islamist armies  financed by the Global Coalition Against Terrorism. (See the Telesur link at the end of this document. It says that on 8.4.2o18, more than 50,000 inhabitants were returning to their homes in Eastern Ghouta). President Bachar al-Assad is the leader of a government and not of a ‘regime’. 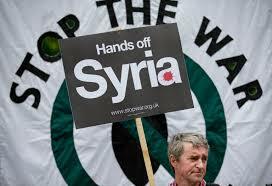 The labelling of Syria as ‘a regime’ is a ploy to demonise that country without having to explain why. Should the phrase ‘regime’ apply to the most monstrous countries of the world, Israel should surely be called ‘a regime’. This deceit is part of a world campaign to present capitalism as always democratic, and denounce any State opposed to its interests as always infamous and intolerable. From March 2011 and the start of the imperialist war on Syria, the main media of the big capitalist countries insisted in saying that the Syrian population was being so horribly maltreated by its own government that it had to arm itself. World news then kept repeating that the “originally moderate” opposition to Assad was forced to resort to war due to the exceptional inflexibility and ferocity of the Syrian government. This is not true because the capitalist countries were sending to Syria the armed individuals they had been training militarily many months beforehand, in countries like Jordan, to carry out ‘regime change’ in Syria. For seven years, the population of Eastern Ghouta (an area of the capital Damascus) was kept hostage by the forces of the above-mentioned Islamic terrorist ‘rebels’ and ‘moderates’. The latter kidnapped the local population and used it as shield to stop the Syrian army wading in to dislodge them. The Western news agencies presented the case – and they still do – of Bashar al-Assad attacking ‘his own people’ with ‘barrel bombs’ and ‘chemical weapons’ (as in Ghouta in August 2013, and again today, 8.4.2018) . Because the leaders of the capitalist countries seek Assad’s overthrow, they support these terrorists and call them ‘moderates’, ‘rebels’ or ‘combatants’. These ‘moderates’ quickly go back to being ‘terrorists’ when their actions stop corresponding to their masters’ interests. After the recovery of Aleppo at the end of 2016, and that of Palmyra in March 2017, the alliance Syria-Russia-Iran opened the road for the complete liberation of Syria. 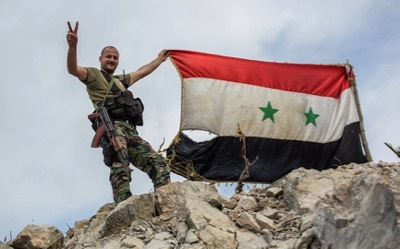 They decided to wipe out the Islamist terrorist militias whom the Western media called variously Daesh, IS, al-Nusra, ISIS, al-Qaida, ISL, Jaysh-al-Islam and many other things. The Syrian army and its allies decided to defend the Assad government, as well as the national integrity and sovereignty of Syria. This action amounted to the defence of the Syrian Revolutionary State, a secular State, a multi-cultural State, the most socially advanced in the whole of the Middle East up to 2011. The year 2011 was when the International Coalition decided to attack Syria militarily with the use [by proxy] of Nato and Nato’s Middle-East partners. The Western media was back with its old accusations of “the use of chemical weapons” and “the massacre of thousands of civilians” by the forces of the Syrian government. It had no scruples in heaping the grossest lies on top of all this. We already published on our blog one of the latest speeches by the Dr Bashar al-Jaafari, the Syrian representative of the Syrian government at the United Nations. We wanted his point of view valued. It carries more legitimacy than that of all the Nato-serving journalists and experts around. It should not be forgotten that the Assad government and all its representatives came to power in Syria through elections. The elections of 3 June 2014 were held during war-time in the part of the country that had not yet been invaded by the Global coalition and its Islamist terrorist bands. A [defence] Front was also set up at the time, with the participation of elements who had belonged to the 2011 opposition. The Front agreed to defend the integrity of the country, the Syrian Constitution and the multi-cultural character of the country. The government of Bashar al-Assad has the fullest and most legitimate right to create the political alliances necessary to its defence. Its ties with Russia do not come from today. They go back to the epoch of the USSR. They are the essential factor behind Syria’s ability to confront this invasion from the most reactionary allies of the Western world in the Middle East and the Near East, like Saudi Arabia, Qatar, the Emirates, Jordan, Israel. It was under Putin’s presidency that Russia decided to take Syria’s side. If Russia could do this, it was thanks to its army and thanks to the support it received in the majority of the Russian population. Through this action, Russia re-connects with the Soviet tradition of international solidarity. Not driven solely by immediate economic interests, it does not seek to appropriate the Syrian oil and gas. Particularly important is how it faces down the imperialist powers instead. The United States and their allies had come to think they can invade and dominate the world economically and politically with impunity. They want to continue fragmenting and destroying entire countries – as in Yugoslavia, Afghanistan, Libya, Iraq – with all the chaos and misery they provoke with their humanitarian wars’. In every part of the world, people resist the drive to war. They see war becoming for ever more vicious, sophisticated, destructive and cruel. From Vietnam onwards, the young learned to resist military service. We remember those veterans of the Iraq war who protested by flinging their military medals to the ground (3). The capitalist powers are increasingly resorting to ultra-sophisticated, cyber and technological means because the people refuse to make war. The capitalist powers are also resorting to the world organisation of fascist bands. Whether these are called Islamic State, al-Islamya, al-Sham, wal-Jihad, Daesh, al-Nusra, al-Qaeda or Jaish al-Islam – they are all the private militias of terrorism. These types that are identified as ‘radicalised’ in the media, and by ‘experts’ all sorts. It is worth highlighting that the first contingents of such people were Afghans and Chechens – and not Muslim Arabs or even ‘moderate’ Libyans, Syrian or Iraqis. The crisis between Turkey and the United States comes partly from Turkey’s implacable hostility to the Turkish Kurds and the Syrian ones. For strategic interests, the United States have made alliances with some of those Kurds. This is how the United States and Turkey, both Nato countries, find themselves temporarily on opposite sides in Syria. As Russia uses this contradiction to its advantage, this encourages the masses of the whole region. It also helps to weaken the military front of Nato and its ‘regime change’ ambitions. Although there are progressive forces inside the Kurdish organisations, their persistent nationalism allows their right-wings to step forward and strike alliances with US imperialism and its allies. If the Syrian Kurds find themselves isolated now, it is because they refused the hand of friendship that Russia and Iran offered them. This process confirms that the epoch has gone when one could hope to progress through the defence of national rights and self-determination. Our epoch calls more for the planning of the world than for the setting up of new nations. Through its capitalist structure, Turkey remains a key State in the Nato alliance and a key ally of the United States. If Turkey makes occasional and sporadic alliances with Iran or Russia, it is due to the war-feverishness growing out of control in the capitalist relations. Syria reiterates what the victory of Vietnam has already established: Capitalism has nothing but its military might to try and perpetuate its system, but the development of the economy, of technology and of human intelligence has created forces now superior to military might. This is why the leaderships of Iran, Russia and Syria are partially fulfilling a necessary social function in history, even if this function surpasses their own imaginings. Humanity is not looking for more petrol and gas. 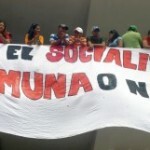 Its survival demands the defeat of the forces of imperialism. The advances made by Syria with the help of Iran and Russia facilitate enormously the revolutionary transformation of the world – starting with their own revolutionary transformation. This has also the effect of precipitating the coming of global war. The period we are entering is one of war and revolution. Russia and Iran will not be able to withdraw from Syria. Their continued existence is going to depend on their ability to widen and deepen the anti-imperialist front they have just opened. As for what is happening in the capitalist countries of the Western world today, each struggle in defence of our already-acquired social gains stands in direct confrontation with global capital. There is an objective united front in the world: it is between the struggle of the working class and masses in the capitalist countries, and the courageous anti-imperialist alliance China-Russia-Iran-Syria. 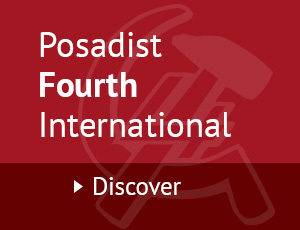 In our capitalist countries – particularly in the United States and Europe – the organisations of the left are facing the need to integrate and reinforce this [objectively] united anti-imperialist front. In July 2011, the Syrian National Council SNC (containing elements that would develop into ISL, ISIS, IS, al-Qaeda and various Jihadists) became supported by 17 countries belonging to the United Nations (including the US, UK and France from the UN Security Council). The SNC was then recognized as “the legitimate representative of the Syrian people” by the Cooperation Council of the Arab States of the Gulf (CCASG); and as “representative of the aspirations of the Syrian people” by the Arab League (Nov 2012). The CCASG is comprised of Bahrain, Kuwait, Oman, Qatar, S. Arabia and the United Arab Emirates. All monarchies. They seek to attract Jordan, Morocco and Yemen to their side, to counter-balance Iran’s growing influence in the region. In the link just below, the reader will see how Western-backed organisations create incidents of apparent (or real) atrocities for which the Syrian government can then be blamed. A UN report eventually accused ISIS to have used sulfur mustard against people in the locality of Marea (Aug 2015). After chemical attacks on Khan al-Assal (19.3.13), on Saraqib (29.4.13), on Jobar (24.8.13) and Ashrafiyat (25.8.13), the UNHCR Commission suggested that the perpetrators were having access to the Syrian’s army stockpiles. The latter were destroyed with Russian support in 2014, but the ‘chemical’ attacks continued. Some press articles appeared, making accusations in the direction of the ‘Islamic State of Iraq and the Levant’ and other Syrian ‘opposition forces’. In April 2017, the US partially destroyed the Syrian airbase of Shayrat in retaliation for a chemical attack on Khan Shaykun that it blamed on Syria. 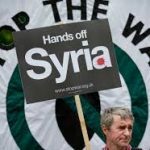 But it is demonstrably not in Syria’s interest to shoot itself in the foot in this way; and it is definitely in the interests of those who want ‘regime change’ in Syria, because they can then attack Assad for ‘killing his own people’. (3) On the 21 May 2012, 50 US veterans demonstrated against Nato in Chicago. They threw their service medals in the streets in public, and declared their opposition to the US-led wars in Iraq and Afghanistan.